The Consumer Price Index (CPI) rose 2.2% on a year-over-year basis in May, matching the increase in April. All eight major components increased on a year-over-year basis in May, although five of the eight major components grew at a slower rate. The transportation index rose 5.6% in May, following a 4.7% increase in April. Energy prices rose 11.6% year over year in May, following a 6.3% increase in April. This growth was led by the gasoline index, which rose 22.9% in the 12 months to May. The electricity index (-0.8%) posted a smaller decline on a year-over-year basis in May than in the previous month. Prices for fuel oil and other fuels were up 22.2% in the 12-month period ending in May. The all-items excluding energy index increased 1.6% on a year-over-year basis in May after a 1.9% increase in April. The principal factor offsetting the increase in May was a decline in the telephone services index, which fell 7.1% year over year, following a 0.9% decrease in April. The traveller accommodation index declined 4.2% in the 12 months to May. 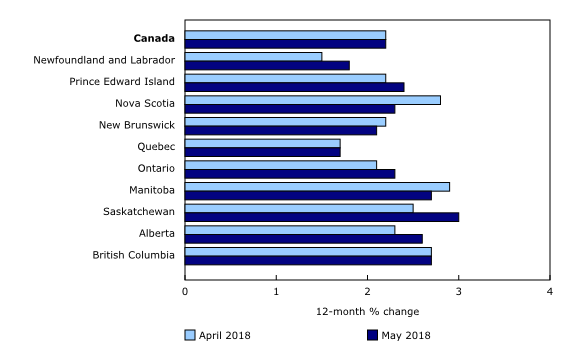 Prices rose more on a year-over-year basis in five provinces in May compared with the previous month. The fresh vegetables index registered larger declines on a month-over-month basis in the Atlantic provinces compared with the other provinces. Prices for telephone services decreased the most month over month in Newfoundland and Labrador, Prince Edward Island and New Brunswick. 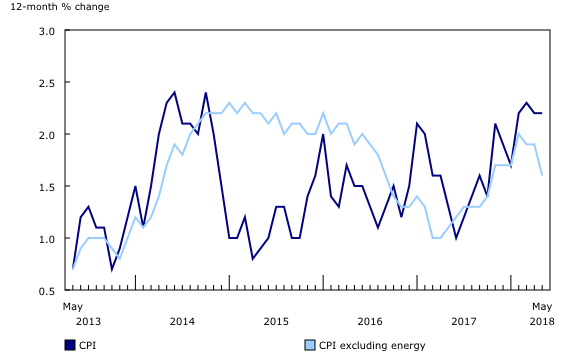 On a seasonally adjusted monthly basis, the CPI increased 0.1% in May, matching the increases in April and March. 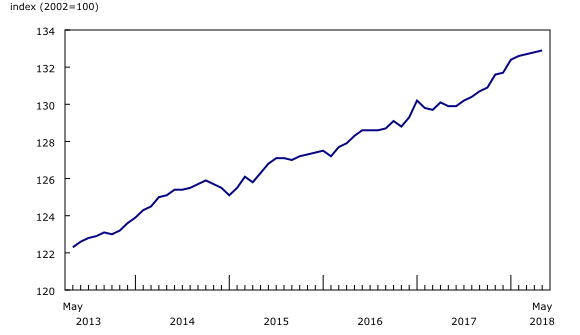 The recreation, education and reading index (+1.7%) registered the largest gain, while the household operations, furnishings and equipment index (-1.0%) declined the most. The publication Consumer Price Index (Catalogue number62-001-X) has been discontinued. The associated data tables have been integrated into the website and will be dynamically updated as new results are released. The following document presents both former CANSIM tables and the new data tables: Consumer Prices Division – Concordance Table. 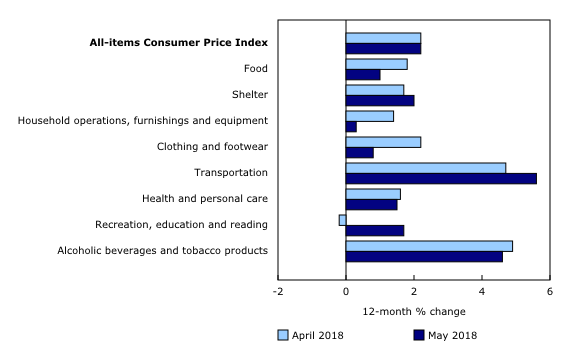 Data on inter-city indexes of price differentials of consumer goods and services will be updated to October 2017 with the release of the June 2018 Consumer Price Index (CPI) (to be published on July 20, 2018). As well, the geographic strata "Whitehorse, Yukon" and "Yellowknife, Northwest Territories" will be introduced into the table, reflecting data for the all-items index and its eight major components and selected sub-groups. Real-time data table 18-10-0259-01 will be updated on July 9. The CPI for June will be released on July 20.